Since 1978, the occupiers of the Vatican ordered that no Catholic publication could run this interview with Archbishop Lefebvre. The complete and unedited interview is transcribed below. Archbishop Lefebvre spoke out 14 years ago in opposition to trends that have now created a schism, leaving true Catholics without so much as a square foot of property or two bricks upon one another. This was prophesied many times, both in ancient days and recently. The church is in eclipse. The questions asked of the archbishop are in dark type; his responses in light type. No. First of all, I have not signed all the documents of Vatican II because of the last two acts. The first, concerned with “Religion and Freedom,” I have not signed. The other one, that of “The Church in the Modern World”, I also have not signed. This latter is in my opinion the most oriented toward modernism and liberalism. I have talked to the pope. I have talked to the council. I have made three public interventions, two of which I have filed with the secretariat. Therefore, there were five interventions against these resolutions of Vatican II. In fact, the opposition led against these resolutions was such that the pope attempted to establish a commission with the aim of reconciling the opposing parties within the council. There were to be three members, of which I was one. When the liberal cardinals learned that my name was on this commission, they went to see the holy father (the pope) and told him bluntly that they would not accept this commission and that they would not accept my presence on this com- mission. The pressure on the pope was such that he gave up the idea. I have done everything I could to stop these resolutions which I judge contrary and destructive to the Catholic faith. The council was convened legitimately, but it was for the purpose of putting all these ideas through. Their opposition is based on an inaccurate understanding of obedience to the pope. It is, perhaps, a well-meant obedience, which could be traced to the ultramontane obedience of the last century, which in those days was good because the popes were good. However, today, it is a blind obedience, which has little to do with a practice and acceptance of true Catholic faith. At this stage it is relevant to remind Catholics all over the world that obedience to the pope is not a primary virtue. The hierarchy of virtues starts with the three theological virtues of faith, hope and charity followed by the four cardinal virtues of justice, temperance, prudence and fortitude. Obedience is a derivative of the cardinal virtue of justice. Therefore it is far from ranking first in the hierarchy of virtues. Certain bishops do not wish to give the slightest impression that they are opposed to the holy father. I understand how they feel. It is evidently very unpleasant, if not very painful. I certainly do not like to be in opposition to the holy father, but I have no choice considering what is coming to us from Rome at present, which is in opposition to the Catholic doctrine and is unacceptable to Catholics. I think that humanist and liberal ideas spread throughout the 19th and 20thcenturies. These secular ideas were spread everywhere, in government and churches alike. These ideas have penetrated into the seminaries and throughout the church. And today the church wakes up finding itself in a liberal straitjacket. This is why one meets liberal influence that has penetrated all strata of secular life during the last two centuries, right inside the church. Vatican Council II was engineered by liberals; it was a liberal council; the pope is a liberal and those who surround him are liberals. The pope said that it was necessary to accept humanist ideas, that is was necessary to discuss such ideas; that it was necessary to have dialogs. At this stage, it is important to state that dialogs are contrary to the doctrines of the Catholic faith. Dialogs presuppose the coming together of two equal and opposing sides; therefore, in no way could (dialog) have anything to do with the Catholic faith. We believe and accept our faith as the only true faith in the world. All this confusion ends up in compromises, which destroy the church’s doctrines, for the misfortune of mankind and the church alike. I would not say that Vatican II would have prevented what is happening in the church today. Modernist ideas have penetrated everywhere for a long time and that has not been good for the church. But the fact that some members of the clergy have professed such ideas, that is to say the ideas of perverted freedom, in that case-license. The idea that all truths are equal, all religions are the same, consequently, all the moralities are the same, that everybody’s conscience is equal, that everybody can judge theologically what he can do – these are really humanist ideas – (the idea) of total license with no discipline of thought whatever which leads to the position that anybody can do whatever he likes. All of this is absolutely contrary to our Catholic faith. By ‘majority of the people,’ I mean all the people who honestly work for a living. I mean the people on the land, people of common sense in contact with the real world, the lasting world. These people are the majority of the people, who prefer traditions and order to chaos. There is a movement of all these people throughout the world, who are slowly coalescing in total opposition to all the changes that were made in their name, of their religion. These people of good will and good sense have been so traumatized by these dramatic changes that they are now reluctant to attend church. When they go into a modernist church, they do not meet what is sacred-the mystical character of the church, all that which is really covine. What leads to God is divine and they no longer meet God in these churches. Why should they come to a place where God is absent? People perceive this very well and the liberal cardinals and their advisers have seriously underestimated the loyalty of the majority to their true faith. How (else) can you explain that as soon as we open a traditional chapel or church, every-body rushes in from everywhere? We have standing room only. The Masses go on all day to accommodate the faithful. Why? Because they find once again what they need: the sacred, the mystical, the respect for the sacred. For instance, you would see at the airport different people coming to the priests who were there to meet me, shaking their hands – total strangers. Why? Because where people find a priest, a real priest, a priest that behaves like a priest, who dresses like a priest, they are attracted to him immediately and follow him. This happens here in the United States, it happens in Europe and everywhere in the world. People in the street coming to greet a priest; they come to congratulate him out of the blue and tell him how glad they are to see a real priest, to tell him how glad they are that there are still some priests. The new Offertory prayers do not express the Catholic notion of the sacrifice. They simply express the concept of a mere partaking of bread and wine. For instance, this Tridentine Mass addressed to God the prayer: “Accept O Holy Father, heavenly and eternal God, this immaculate victim which your unworthy servant offers to you, my living and true God to atone for my numberless sins, offenses and negligences.” The New Mass says: ‘We offer this bread as the bread of life.’ There is no mention of sacrifice or victim. This text is vague and imprecise, lends itself to ambiguity and was meant to be acceptable to Protestants. It is, however, unacceptable to the true Catholic faith and doctrine. The substance has been changed in favor of accommodation and compromise. First the question of the Latin Mass is a secondary question under certain circumstances. But under another aspect it is a very important question. It is important because it is a way to fix the word of our faith, the Catholic dogma and doctrines. It is a way of not changing our faith because in translations affecting these Latin words, one does not render exactly the truth of our faith as it is expressed and embodied in Latin. It is indeed very dangerous because little by little one can lose faith itself. These translations do not reflect the exact words of the Consecration. These words are changed in the vernacular. Yes. For instance, in the vernacular, it is said that “the Precious Blood is for all.” When in the Latin text (even the latest, revised Latin text), the text says, “the Precious Blood is for many” and not for all. All is certainly different from many. This is only a minor example that illustrates the inaccuracies of current translations. Yes. For example, in the Latin text, the Virgin Mary is referred to as “Semper Virgo,” “always virgin.” In all the modern translations, the word “always” has been deleted. This is very serious because there is a great difference between “virgin” and “always virgin.” It is most dangerous to tamper with translations of this kind. Latin is also important to keep the unity of the Church because when one travels – and people travel more and more in foreign countries these days – it is important for them to find the same echoes that they have heard from a priest at home, whether in the United States, South America, Europe or any other part of the world. They are at home in any church. It is their Catholic Mass, which is being celebrated. They have always heard the Latin words since childhood, their parents before them, and their grandparents before them. It is an identifying mark of their faith. Now, when they go into a foreign church, they don’t understand a word. Foreigners who come here don’t understand a word. What is the good of going to a Mass in English, Italian or Spanish when no one can understand a word? But wouldn’t most of these people understand Latin even less? What is the difference? The difference is that the Latin of the Catholic Mass has always been taught through religious instruction since childhood. There have been numerous books on the matter. It has been taught throughout the, ages – it is not that difficult to remember. Latin is an exact expression, which has been familiar to generations of Catholics. Whenever Latin is found in another Church, it immediately creates the proper atmosphere for the worship of God. It is the distinctive tongue of the Catholic faith, which unites all the Catholics throughout the world regardless of their national tongue. They are not disoriented or baffled. They say: This is my Mass, it is the Mass of my parents, it is the Mass to follow, it is the Mass of our Lord Jesus Christ. It is the eternal and unchanging Mass. Therefore from the point of view of unity, it is a very important symbolic link; it is a mark of identity for all Catholics. But it is far more serious than simply a change of tongue. Under the spirit of Ecumenism, it is an attempt to create a rapprochement with the Protestants. All this is very dangerous because it is our faith that is attacked. When a Protestant celebrates the same Mass as we do, he interprets the text in a different way because his faith is different. Therefore, it is an ambiguous Mass. It is an equivocal Mass. It is no longer a Catholic Mass. There is an Ecumenical Bible made two or three years ago, which was recognized by many bishops. I do not know whether the Vatican publicly endorsed it, but it certainly did not suppress it because it is used in many dioceses. For instance, two weeks ago, the Bishop of Fribourg in Switzerland had Protestant pastors explaining this Ecumenical Bible to all the children of Catholic schools. These lessons were the same for Catholics and Protestants. And what has this Ecumenical Bible to do with the Word of God? Since the Word of God cannot be changed, all this leads to more and more confusion. When I think that the archbishop of Houston, Texas will not allow Catholic children to be confirmed unless they go with their parents to follow a 15-day instruction course from the local rabbi and the local Protestant minister. If the parents refuse to send their children to such instructions, they (the children) cannot get confirmed. They have to produce a signed certificate from the rabbi and the Protestant minister that both the parents and the children have duly attended the instruction and only then can they (the children) be confirmed by the bishop. These are the absurdities with which we end up when we follow the liberal road. Not only this, but now we are even reaching the Buddhists and the Moslems. Many bishops were embarrassed when the representative of the pope was received in a shameful manner by the Moslems recently. I do not recall all the specific details, but this incident happened in Tripoli, Libya, where the representative of the pope wanted to pray with the Moslems. These Moslems refused and went about their separate ways and prayed in their fashion, leaving the representative high and dry, not knowing what to do. This illustrates the naiveté of these liberal Catholics who feel that it is enough to talk with these Moslems and for them to accept immediately a compromise of their own religion. The mere fact of wanting to have a close relationship with the Moslems for that purpose only attracts the contempt of the Moslems toward us. It is a well-known fact that Moslems will never change anything of their religion; it is absolutely out of the question. If the Catholics come to equate our religion with theirs, it only leads to confusion and contempt, which they take as an attempt to discredit their religion and not caring about our religion. They are far more respectful of anyone who says that, “I am a Catholic; I cannot pray with you because we do not have the same convictions.” This person is more respected by the Moslems than the one who says that all the religions are the same; that we all believe the same things; we all have the same faith. They feel this person is insulting them. But doesn’t the Koran display moving verses of praise toward Mary and Jesus? Islam accepts Jesus as a prophet and has great respect for Mary, and this certainly places Islam nearer to our religion than say, for instance, Judaism, which is far more distant from us. Islam was born in the 7th century and it has benefited to some degree from the Christian teachings of those days. Judaism, on the other hand, is the heir to the system, which crucified our Lord. And the members of this religion, who have not converted to Christ, are those who are radically opposed to our Lord Jesus Christ. For them, there is no question whatever of recognizing our Lord. They are in opposition to the very foundation and existence of the Catholic faith on this subject. However, we cannot both be right. Either Jesus Christ is the Son of God and the Lord and Savior or He is not. This is one case where there cannot be the slightest compromise without destroying the very foundation of Catholic faith. This does not only apply to religions, which are directly opposed to the divinity of Jesus Christ as the Son of God but also to religions, which, without opposing Him, do not recognize Him, as such. But isn’t God the same God for all the people of the world? Yes. I believe that God is the same God for the whole universe according to the faith of the Catholic Church. But the conception of God differs greatly from religion to religion. Our Catholic faith is the one and only true faith. If one does not believe in it absolutely, one cannot claim to be a Catholic. Our faith is the one that in the world we cannot compromise in any way. God as conceived by the Moslems says: “When God says to His believers, ‘When you go to paradise, you will be a hundred times richer than you are now on earth. This also applies to the number of wives that you have here on earth’.” This conception of God is hardly what our Lord and Savior is about. I feel that on the side that Pope St. Pius V wanted to engage his infallibility because he used all the terms that all the popes traditionally and generally used when they want(ed) to manifest their infallibility. On the other hand, Pope Paul VI said himself that he didn’t want to use his infallibility. Yes. The pope has manifested this in the council, which is not a Dogmatic council. He has also clearly stated so in his encyclical called Ecclesiam Suam.He has stated that his encyclicals would not define matters but he wished that they would be accepted as advice and lead to a dialogue. In his Credo, he said that he did not wish to employ his infallibility, which clearly shows where his leanings are. But isn’t the fact that Pope Paul VI occupies the seat of St. Peter enough for you to heed whatever the pontiff as the vicar of Christ on earth asks you to do, just as other Catholics do? Unfortunately, this is an error. It is a misconception of papal infallibility because since the Council of Vatican I, when the dogma of infallibility was proclaimed, the pope was already infallible. This was not a sudden invention. Infallibility was then far better understood than it is now because it was well known then that the pope was not infallible on everything under the sun. He was only infallible in very specific matters of faith and morals. At that time, many enemies of the church did all they could to ridicule this dogma and propagate misconceptions. For example, the enemies of the church often said to the unknowing and naive that if the pope said a dog was a cat, it was the duty of Catholics blindly to accept this position without any question. Of course this was an absurd interpretation and the Catholics knew that. This time the same enemies of the church, now that it serves their purpose, are working very hard to have whatever the pope says accepted, without question, as infallible, almost as if his words were uttered by our Lord Jesus Christ himself. This impression, although widely promoted, is nevertheless utterly false. Infallibility is extremely limited, only bearing on very specific cases which Vatican I has very well defined and detailed. It is not possible to say that whenever the pope speaks he is infallible. The fact is that the pope is a liberal, that all this liberal trend has taken place at the Council of Vatican II, and created a direction for the destruction of the church – a destruction which one expects to happen any day. After all of these liberal ideas have been infiltrated into the seminaries, the catechisms and all the manifestations of the church, I am now being asked to align myself with these liberal ideas. Because I have not aligned myself with these liberal ideas that would destroy the church, there are attempts to suppress my seminaries. And it is for this reason that I am asked to stop ordaining priests. Enormous pressure is being exerted on me to align myself and to accept this orientation of destruction of the church, a path which I cannot follow. I do not accept to be in contradiction with what the popes have asserted for 20 centuries. Both myself and those who support me obey all the popes who have preceded us, or we obey the present pope. If we do (obey the present pope, i.e. Paul VI), we then disobey all the popes that have preceded us. Finally we end up disobeying the Catholic faith and God. But as the bishops (of old) obeyed the popes of their days, shouldn’t you obey the pope of your day? On the contrary, I’m completely Roman and not at all Gallican. I’m for the pope as successor of St. Peter in Rome. All we ask is that the pope be, in fact, St. Peter’s successor, not the successor of J.J. Rousseau, the Freemasons, the humanists, the modernists and (the) liberals. I trust our Lord the Saviour. The priests of the Society of St. Pius X trust our Lord and I have no doubt that God is inspiring us all. All those who fight for the true faith have God’s full support. Of course, compared to the liberal machine, we are very small. I could die tomorrow. But God is allowing me to live a little longer so that I can help others in fighting for the true faith. It has happened before in the church. True Catholics had to work for the survival of the faith under general opprobrium and persecution from those who pretended to be Catholics. It is a small price to pay for being on the side of Jesus Christ. It happened with the very first pope. St. Peter was leading the faithful in error by his bad example of following Mosaic Laws. St. Paul refused to obey this order and led the opposition to it. Paul won out and St. Peter rescinded his error. In the fourth century. St. Athanasius refused to obey Pope Liberius’s orders. At that time, the church had been infiltrated by the ideas of the Arian heresy and the pope had been pressured to go along- with them. St. Athanasius led the opposition against this departure from church doctrine. He was attacked mercilessly by the hierarchy. He was suspended. When he refused to submit, he was excommunicated. The opposition to the heresy finally built up momentum and at the death of Pope Liberius, a new pope occupied St. Peter’s seat and recognized the church’s indebtedness to St. Athanasius. The excommunication was lifted. He was recognized as a savior of the church and canonized. In the seventh century, Pope Honorius I favored the Monotheletism heresy – the proposition that Jesus Christ did not possess a human will and hence was not a true man. Many Catholics who knew the church doctrines refused to accept this and did everything they could to stop the spread of this heresy. The Council of Constantinople condemned Honorius I in 681 and anathematized him. There are many more examples of this nature when true Catholics stood up against apparent great odds, not to destroy or change the church but to keep the true faith. I do not consider the odds overwhelming. One of the major aims of our society is to ordain priests – real priests – so that the Sacrifice of the Mass will continue; so that catechisms will continue; so that the Catholic faith will continue. Of course some bishops attack and criticize us. Some try to thwart our mission. But this is only temporary because when all the seminaries will be empty – they are almost empty now – what will the bishops do? Then there will be no more priests. Because the seminaries of today are not teaching anything about the making of a priest; they teach liberal psychology, sociology, humanism, modernism and many other sciences and semi sciences that are either contrary to Catholic doctrine or have nothing whatever to do with church teachings or with what a priest should know. As for Catholic teachings, they are hardly being taught in today’s seminaries. It is precisely because my stand is unequivocal that they support me. Many other Christian denominations have always looked at Rome as something of a stabilizing anchor in a tumultuous world. Whatever happened, they felt, Rome was always there, eternal, unchanging. This presence gave them comfort and confidence. Even more surprising are the Islamic leaders who have warmly congratulated me on my stand even though they fully know that I do not accept their religion. Differences and divisions are part of this world. The unity of the church can only be gained by example and unswerving commitment to our Catholic faith. Charity starts with loyalty to one’s faith. Apart from direct, frequent contact these people have made with me, there was, for example, an extensive survey conducted by a reputable newspaper in Paris and they have surveyed members of these various denominations. The result was that far from finding our faith offensive or threatening to them, they admired the unequivocal stand, which we are taking. On the other hand, they show utter contempt for all those liberal Catholics who were trying to make a mishmash of our Catholic faith as well as their religion. One must understand the meaning of obedience and must distinguish between blind obedience and the virtue of obedience. Indiscriminate obedience is actually a sin against the virtue of obedience. So if we disobey in order to practice the virtue of obedience rather than submit to unlawful commands contrary to Catholic moral teachings, all one has to do is to consult any Catholic theology books to realize we are not sinning against the virtue of obedience. 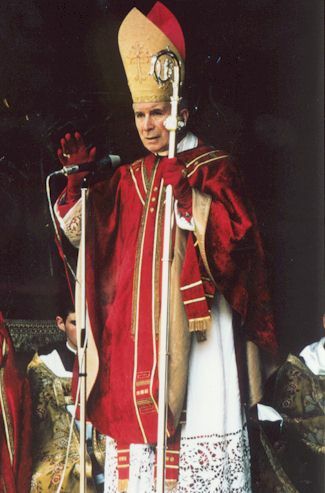 1 The followers of Archbishop Marcel Lefebvre insist on preserving the so-called Tridentine Mass. This was the Mass (and attendant ritual) that followed upon the Council of Trent (Trento, Italy) and that was pronounced as permanent and irrevocable by Pope St. Pius V in 1570. This is the Mass that Latin Rite Roman Catholics knew for 400 years until the service was rewritten after Vatican Council II (1962-1965). 2 Gallicanism, associated with French Roman Catholicism, was a tradition of resistance to papal authority. There were two aspects of Gallicanism, royal and ecclesiastical. The first asserted the rights of French monarchs over the French Roman Catholic Church; the second asserted the rights of general councils over the pope. Both were condemned as heresies at the First Vatican Council in 1870. I HAVE NEVER ONCE HEARD THE LATIN MASS. I WISH TO HEAR IT AND ALSO GREGORIAN CHANTING IN THE CATHEDRALS. THANK YOU FOR POSTING THIS. I GAINED MUCH CLARITY AND LOST MUCH CONFUSION. “Israel regularly evacuates Islamist fighters (and some civilians as well) wounded in the fighting against the regime in the region. Angry local Druze intercepted an IDF ambulance carrying two wounded fighters (the IDF claims they were civilians). They beat the army medics, who were forced to flee. They then beat one of the wounded Syrians to death and severely wounded the other, before the authorities intervened and rescued him. The Israeli military is aghast at this infringement on its right to meddle in Syrian internal affairs unmolested. Defense minister Yaalon called the killing a “lynch.” This is Israeli code for ‘Arab savagery.’ It is used to differentiate Israeli behavior, supposedly civilized and humane, from that of Palestinian militants. When you play with matches, you’ll get burned. The white race extinguishes itself by disregarding the true Catholic Faith.